Riding around a track is one of the most exciting things you can do on a motorbike. As well as giving you the opportunity to really open your bike out – and test your riding ability – it’s also a chance for you to feel like a fully-fledged racer in your leathers with your knee sliders on. But before you get carried away, remember you’re not Marc Marquez or Valentino Rossi, so you need to keep a lid on things, as well as a couple of other bits and bobs. 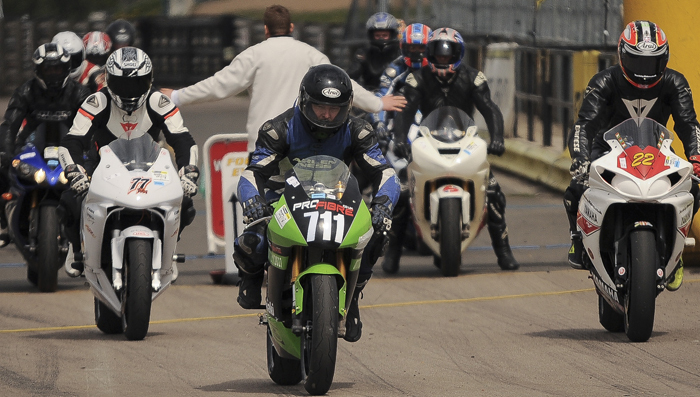 Read on for our guide on what to expect from a motorbike trackday. You’ll normally get six or seven 20-minute sessions on the track with around 40 minutes in between sessions. You’ll also have time for lunch and to get your bike refuelled if it needs it. The day usually starts at 07:30 and finishes around 17:00. You don’t have to use your own bike and most trackday providers will have a number of bikes available to use for the day for a fee. Most riders use their own bikes. How do I decide what group I’m in? You need to be honest with the trackday providers to determine what group you should be in. If you’ve never done it before, you’re a beginner, no matter how quick you think you are. Will my motorbike insurance cover a trackday? 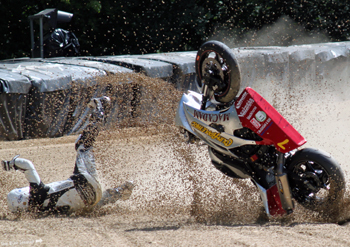 Most insurance policies will not cover trackdays however some might. Check with your insurance provider and if you’re not lucky enough to be covered, get some; it can save you a lot of money in the long run. Can I refuel at the track? Most tracks provide fuelling stations however it’s advised to fill up before hand to save money; trackday fuel pumps aren’t cheap. Most groups consist of between 30 and 40 riders. You will need both parts of your driving licence and it’s advisable to bring any indemnity or disclaimer forms with you to the track already completed. Trackdays are long days, often starting at 07:30 and finishing after 17:00. Make sure you take water to keep hydrated and think about taking some food as well. There will be cafes and food stops at the race circuit however it’s worth taking at least some liquid to keep you going. It’s also worth thinking about how you’re going to get there. You will be on your bike for a large portion of the day and you’ll also be concentrating harder than ever. All this can take it out of you so think about accommodation before or after the trackday or consider a trailer or van hire to get you there. Insurance is necessary for trackdays as far as we’re concerned. If the worse comes to the worst and you do come off your bike, your insurance may not cover you for trackday events (if you’re lucky, it might but it’s always worth checking). If you have made no modifications to your bike, it shouldn’t have a problem passing the track’s noise level tests. If you have fitted an aftermarket exhaust then you could be in trouble so it’s worth testing that your bike doesn’t exceed 102dB. 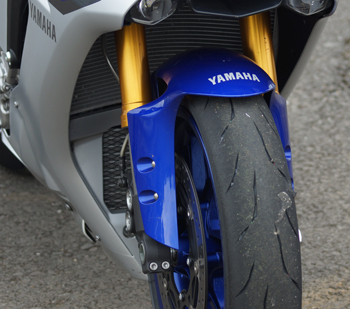 If you’ve got bald tyres you won’t get on the track, so check they’re in full working order because proper tread will help your riding in everyday conditions as well as around a race circuit. Make sure you have both parts of your licence and complete any indemnity and disclaimers before you arrive at the track – it will save you time and get you ready for the track sooner. Most trackday providers will require you to wear a one piece set of leathers however some will allow you to wear a two piece as long as the jacket and trousers can zip together. As well as leathers, you should also think about what you will wear underneath. While you will get plenty of time on the track you will also spend a lot of time standing round. Make sure you have appropriate clothing to suit the weather conditions. Your trackday will use up plenty of fuel so make sure your tank is full to the brim and think about taking some extra fuel with you. Fuel will be available trackside but it won’t be cheap. Always fancied yourself as the next Casey Stoner despite never going round a track before? Get a grip and be honest. You will be asked which group you want to ride with: beginner, intermediate or advanced. Be honest because if you put yourself in the advanced group and you’re not up to scratch, you’ll quickly be found out and could put yourself and other track users in danger. As your old school teacher used to say, it’s your own time your wasting so get to the track on time – the sooner your paperwork is ready the sooner you’re ready for your safety briefing. You’ll need to attend a safety briefing at the track. Here you’ll be told about best practice on a track and what certain signals mean. Pay attention because you’ll need to know what’s going on around you. The instructors, marshals and mechanics are there to help you, so if you have any questions then do ask them – you might not get another chance. Similarly, there will be an opportunity to get your tyres and suspension checked, take up the offer if you’ve been wondering about your bike’s condition. 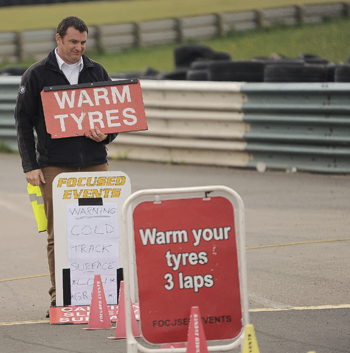 You will be given three laps at the beginning of your first session on the course to warm your tyres up and learn the course. While this is the only time you’ll have to do this, you should do something similar at the start of each session to get your tyres up to optimum temperature. If you’ve never ridden around a track before then you shouldn’t attempt to do it like you’re an expert who’s done it hundreds of times before. Ride to your ability and do not worry if you think you might look too slow or that you’ve been lapped. Everybody starts somewhere and you shouldn’t feel under pressure to push you and your bike harder than you feel comfortable with. The more you go around the track, the more you’ll learn and the more naturally you’ll improve. Trackdays are long days and if you feel tired or think something’s amiss on your bike, don’t be afraid to sit out a session to check your bike or recharge your own batteries. Rule number one when on a track; don’t overcook it going into a corner. Remember, slow in and fast out.